The NTA Biosensor Chip combined with the breakthrough Agile R100 personal assay system decreases the steps needed to gather label-free kinetic binding data, which reduces variability and time to results. 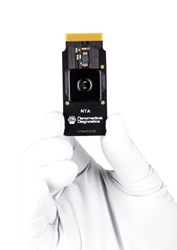 Nanomedical Diagnostics, a cutting-edge life science company pioneering graphene biosensors that accelerate pharmaceutical and biotherapeutics development, announces the launch of a new NTA biosensor chip for use with its label-free Agile R100 assay system. The new biosensor chip enables researchers to study the kinetics of polyhistidine-tagged (His-tagged) molecules quickly and reliably. Nitrilotriacetic acid (NTA) is pre-functionalized on the biosensor surface, enabling fast immobilization of His-tagged molecules. Each chip can provide up to 10 measurements, enabling an entire dose-response curve or replicate data to be run on one chip. Researchers can control the orientation of His-tagged proteins on the sensor surface and easily release them for chip reuse using standard NTA release protocol. Agile R100’s single-sample format brings the sample directly to the sensor surface, which means data can be gathered using a miniscule amount of material. This reduces the amount of protein synthesis required, increasing cost-efficiency. Agile R100 NTA biosensors can detect directly in complex solutions such as DMSO, cell and tissue lysate, and cell growth supernatant, drastically reducing sample prep time. Nanomedical Diagnostics (“Nanomed”) is a life science company based in San Diego, CA. Nanomed has developed a breakthrough electrical assay based on proprietary Field Effect Biosensing (FEB) technology that delivers real-time label-free kinetic binding and affinity data. Unique graphene biosensors at the heart of the assay provide highly-sensitive kinetic characterization of small molecules and proteins in complex solutions such as DMSO, using just a 10 µL drop of sample, making the platform a cutting-edge orthogonal technique for drug discovery hit validation.